Harris Plastering - Plasterer based in Basildon, Essex. 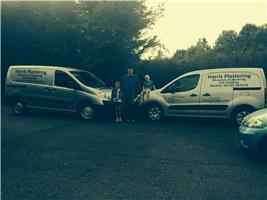 Welcome to Harris Plastering, and thank you for taking the time to read my profile. I have been plastering for 21 years, and for the past 14 years I have been carrying out site work for various contractors. During the past 7 years I have been dedicated to working for myself and building a good reputation for my business. I joined Checkatrade to branch out to more customers and more areas. I am quick, tidy, and leave a perfect finish to paint and my prices are competitive. Thank you again for taking the time to read my profile and I look forward to your call. WITH NEW MATERIALS COMING TO THE MARKET ALL THE TIME WE CAN NOW OFFER MAGNETIC PLASTER/ DURAFINISH HIGH IMACT PLASTER/ AND PURE FINISH WHICH IS AN ACTIVE AIR TECHNOLOGY WHICH WORKS FOR 50 YEARS ABSORBING FORMALDEHYDE EMISSIONS AS YOU DECORATE. ALSO BEING CERTIFIED BY BRITISH GYPSUM WE CAN OFFER A 2 YEAR GARANTEE ON THEIR PRODUCTS WITH THERE BACKING.